The church was established as a preaching station in the sixth century by St. Drostan, a Culdee monk, (an early Celtic missionary). When a saintly pastor died his flock named the church in his memory and our church was dedicated to St. Drostan. We believe that Stobcross is the only surviving relic of this period. It can be found some 400 yards from the church along Stobcross Road, just outside the village boundary. The Norman tower dates from around 1180. 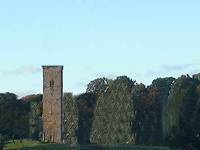 It is a category ‘A’ listed building and is one of five similar towers close to Markinch. The tower is 16 feet square and 80 feet tall. Our picture shows how we believe the tower looked in the twelfth century although there would probably have been various buildings surrounding it. At the beginning of the twelfth century there were moves afoot to remove the Culdee influence as Kind David I and landowners gave their allegiance to the Church of Rome. On 19 July 1243, Bishop David de Bernham re-dedicated the Church of Markinch to St. John the Baptist as he wished to erase any trace of the Culdees. Due to problems within the Church of Rome, The Reformation came about from 1560. There are no contemporary records to say how this affected Markinch. The Covenanters movement was established at the General Assembly in 1638. this was created to defy the attempt of King Charles I to impose the Episcopal form of worship on the Scottish people. Alexander Leslie, First Earl of Leven, was appointed leader. He purchased Balgonie Castle in 1640 and died in April 1661 when he was buried in his own aisle within a previous building on this site. The current church building dates from 1786. A spire was added to the tower during the period 1807-1810 at which time the church was extended. A clock was put into the tower in 1839 and this was renewed in 1929. There was a split in the Established Church in 1843 when the Free Church was founded. Our minister at the time, Dr James Sievewright was one of 474 dissenters and Brunton church was opened for worship on 14 January 1844. The congregation changed the name to St. Marks following a union with Balbirnie Church in 1954. 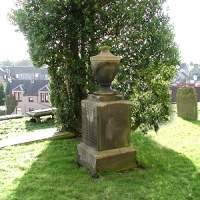 When he died in 1852, having been Moderator of the Free Church, he was buried in the graveyard at the Established Church. The funeral was well attended by members of both congregations. An organ and a new heating system were installed in 1914. The service of dedication was conducted by Dr Andrew Williamson, Moderator of the Church of Scotland. In 1932 the old houses around the churchyard were removed as the Town Council began a scheme of improvement having considered they were unfit for habitation. The churchyard is now surrounded by a tall wall. Unions of Churches came about in 1847, 1900 and 1929. It was after this last mentioned union that the name of the church was amended to St Drostans. In 1969 the congregations of St Marks and St Drostans united to form Markinch Parish Church.